Turó de la Rovira is included in the last foothills of the Coastal Range before the change of slope that forms Barcelona’s plain. This geological formation includes a series of hills that emerge from the urban fabric with heights between 180 and 260 meters above the sea level and constitute one of the most extraordinary and wide balconies over the city. The hilltop where the project is located has undergone several stages of urbanization starting at the beginning of the twentieth century with the construction of several summer homes for wealthy families from Barcelona. During the civil war and due to its strategic location an anti-aircraft battery and some related military installations were built. After the war the city had to cope with a strong wave of immigration that favored the emergence of a settlement based on self construction that later became a populated shantytown. It was not until 2010 that the crown is regained for collective use with an intervention that rings back to the light the dense history of the site including all its layers. In past recent years Barcelona’s planning directors worked with a clear aim to reintegrate Turó de la Rovira’s area into the urban grid imagining new pedestrian routes that would connect it with some of the most signified landmarks of the city as Park Guell, Sant Pau Hospital and Sagrada Familia. This operation required an intervention to improve the access that leads to the veranda of the old batteries through the small inhabited village of Marià Lavèrnia. The project aims to mainly operate by modifying the topography. 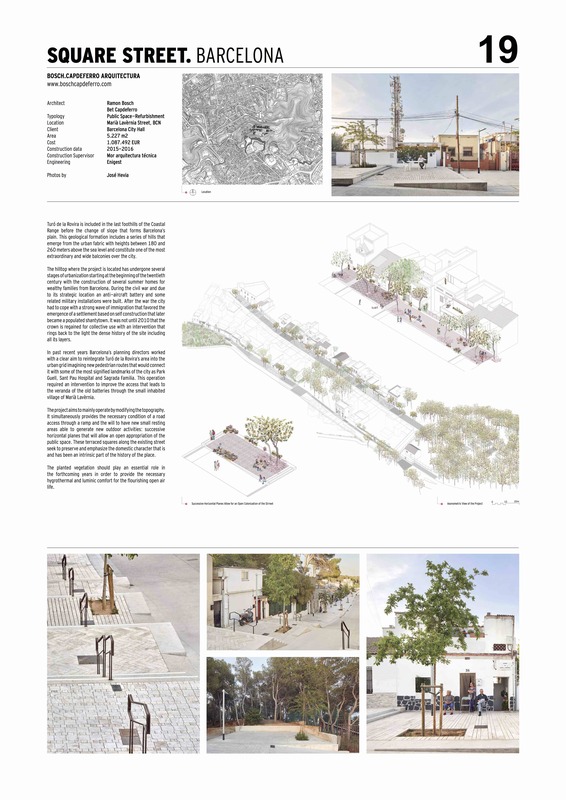 It simultaneously provides the necessary condition of a road access through a ramp and the will to have new small resting areas able to generate new outdoor activities: successive horizontal planes that will allow an open appropriation of the public space. These terraced squares along the existing street seek to preserve and emphasize the domestic character that is and has been an intrinsic part of the history of the place. The planted vegetation should play an essential role in the forthcoming years in order to provide the necessary hygrothermal and luminic comfort for the flourishing open airlife.